Karen Plaisted said she wanted to sing professionally as a child. 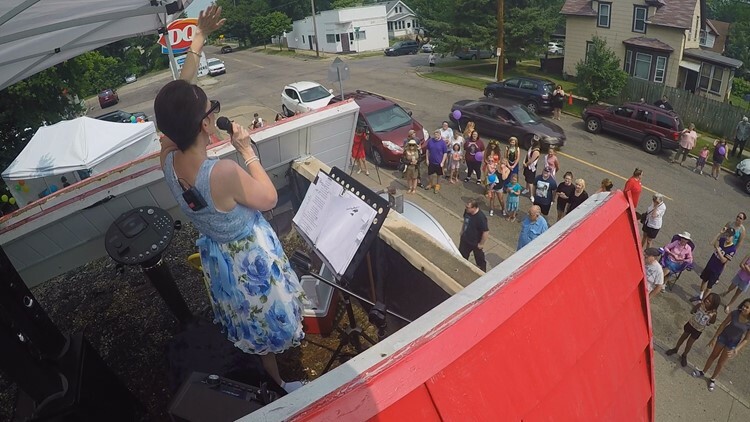 She never got around to achieving that dream, but she took her talents to her Dairy Queen rooftop to fundraise for her granddaughter's multiple heart surgeries. ST. PAUL, Minn. - Twenty-seven years of owning the neighborhood Dairy Queen, Karen Plaisted reigns supreme as the monarch of sugar in East St. Paul. "We got into it when we were children," Plaisted said. "My husband started when he was 11. I started when I was like 13." However, a new royal of the Plaisted family has Karen's attention these days. Edleigh Plaisted, granddaughter of Karen Plaisted has captured Karen's heart fully. Edleigh, or "Eddie Bear" just had her first birthday a few weeks ago. Despite being just one year old, Edleigh has gone through a lot. "This is going to be her 5th surgery," Karen Plaisted explained. "Some people don't even have open-heart surgery once." Born with multiple congenital heart defects, Eddie Bear has fought her way through surgery after surgery. "The way that her repairs are, she's going to need future surgeries no matter what as her heart grows," Eddie Bear's father Giovani Plaisted said. The hospital bills, also growing alongside Eddie Bear. So Karen thought she could use her DQ to help. "I've always wanted to sing on a mountain and I looked up there and thought-- I'll just go up there!" Karen said, pointing to the rooftop of her Dairy Queen building. She held a rooftop benefit concert for her granddaughter on Saturday. From the National Anthem, to hit Disney songs like "Let It Go" from Frozen, Karen belted out tunes for the neighborhood to enjoy. And folks from the neighborhood were generous and happy to chip in. "I feel so grateful to have Eddie because she reminds me that's what's important, to have love in your heart," Karen said. You can find Edleigh Plaisted's GoFundMe page here.